Feel confident you are armed with the best ammunition if faced with a confrontation. 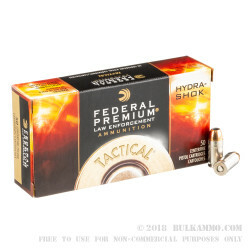 These 45 ACP rounds are equipped with a jacketed hollow point bullet and utilize Federal's unique Hydra Shok technology, improving terminal ballistics. 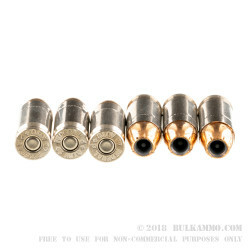 This allows the bullet to penetrate deeper and expand larger than a traditional JHP bullet. They are also Plus P, which increases velocity to help guarantee the bullet will provide maximum force to your intended target. The casings are boxer-primed brass. 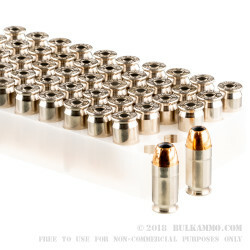 Boxer primers allow for reloading, and brass is an excellent option to prevent corrosion and ensure a smooth feed. This ammunition was originally designed for law enforcement, which is even more convincing when choosing your go-to ammo for self defense. It's unique center-post design helps prevent clothing from clogging the cavity to increase its ability to reliably expand. Reduce your price per round by purchasing this 1000 round case.